Being the sole joint university organisation in Hong Kong, Hong Kong Federation of Business Students is now recruiting students from the 9 local universities to become the Executive Sub-Committees of HKFBS. This programme comprised of three main areas, including the Editorial Board, HSBC/HKU Business Case Competition and the Executive Sub-Committee of HKFBS. Students that joined our programme will have a chance to co-organise the prestigious HSBC/HKU Business Case competition, hold events for 15,000 business undergraduates across Hong Kong, or become the Editors of HKFBS publications. Our Executive Sub-Committees can meet, make friends with, and work with students from the 9 local universities, and you will be part of a team that helps you succeed. 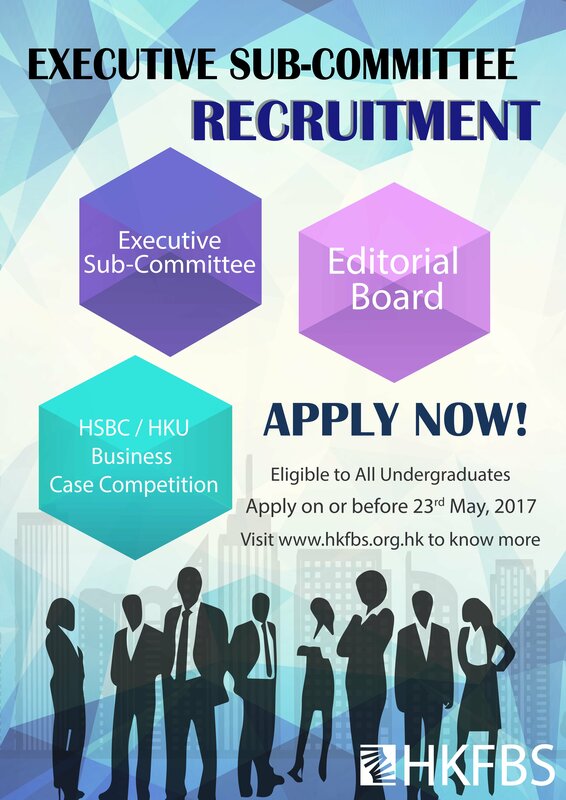 If you are a passionate business undergraduate from any of the 9 local universities who are ready to fully commit yourself to serve all Hong Kong business undergraduates, to work under a progressive and dynamic environment and to elevate your specialities and experience, apply for HKFBS and be part of it! Interested participants please apply with your personal CV.